On Friday 14th July 2018 a new Rescue Convenor at Ballyholme Yacht Club took command of the club’s famous Rescue Team. 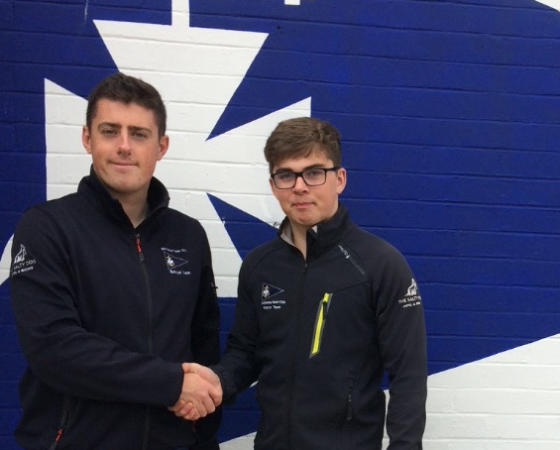 Acting Rescue Convenor, Rory Flannigan officially handed over to the new Rescue Convenor, Oliver Milligan, at a short meeting at the club. Rory had kindly stepped in to fill the gap after the previous Rescue Convenor, Nick Scott, stood down. With thirteen years on the Rescue Team at Ballyholme Yacht Club we asked Rory what the Rescue Team actually does at Ballyholme Yacht Club. To volunteer and to help out you do need to be a member of Ballyholme Yacht Club and hold a RYA Powerboat Level 2 certificate. How long have you been involved in the Rescue Team? What does the Rescue Team do? What are your plans for the Rescue Team now that you are in charge? To help the rescue team grow by getting new members into the team, improve communication within the team and to continue the club’s strong reputation within the national and international sailing. What is the best part of the rescue team? The social aspect of the team is strong and we regularly meet outside of just normal sailing times. My most rewarding experience is rescuing a person tangled in ropes from the water who could’ve drowned had their not been a rescue boat there. Has the rescue team helped you grow as a person? It has definitely helped my confidence as both part and leader of a team, my confidence, given me useful qualifications and helped me meet new people through the club and events. What would you say or advise to people who want to get involved? Don’t be afraid to contact me (olliemilligan1@gmail.com) or Ballyholme Yacht Club (admin@ballyholme.com) to start getting involved. No previous experience is required as the Club has a host of qualified RYA Powerboat instructors who can get you through the relevant qualifications to start helping out, (for young people this will look great on a CV).